Want a fun, easy and healthy breakfast for your kids? 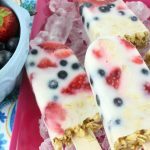 Try these berry yogurt breakfast pops! Even the kids who are picky eaters love munching on one of these fruit and yogurt pops.